Altitude or Height - The Altitude/height of a triangle is the length of a perpendicular from the apex the the base line. 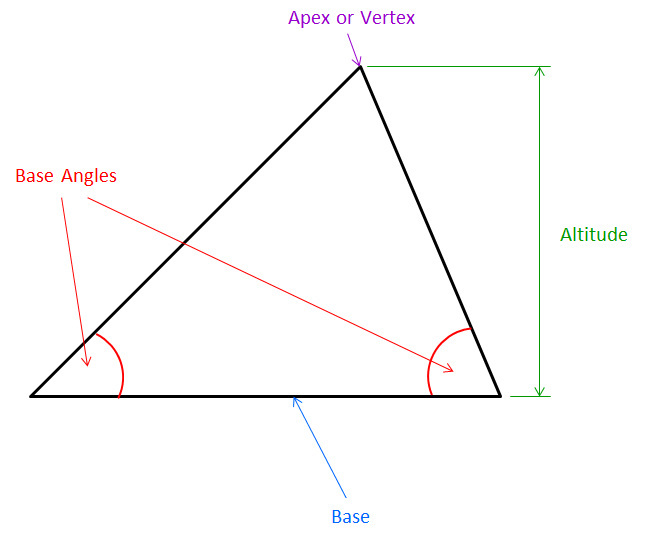 Apex - Once you have selected a base line for the triangle, the vertex opposite that base line is called the apex. Base - For any given triangle, one of the sides can be distinguished as being the base. It is not particularly important which one is chosen. The usual practice is that when you draw a triangle, the side that is horizontal or closest to horizontal is considered to be the base. Vertex - A vertex typically means a corner or point where two lines meet. In a Triangle there is always three Vertices. (Vertices is the plural for vertex).